Ellar Coltrane stars in “Boyhood.” Photo Credit: IFC Films. Although it’s not unusual for child actors to claim they grew up in front of the nation, few can actually say that they had someone literally documenting their life the way that director Richard Linklater (Before Midnight, 2013) does in his newest film, Boyhood. This drama tells the tale of one boy’s life from age six to age eighteen from 2002 through 2014. The result is truly unique. This fascinating movie that will undoubtedly be a strong contender at the Academy Awards for Best Picture and Best Director and deservedly so. The film centers on the childhood of Mason played by the relatively unknown Ellar Coltrane (Hallettsville, 2009) who began filming this movie as a child TV commercial actor after he and his family agreed to this unorthodox filming schedule. Mason grows up alongside his older sister Samantha (played by Lorelei Linklater, the director’s real-life daughter) and their divorced parents, Olivia played by Patricia Arquette, (Boardwalk Empire, 2014) and Mason Sr. played by Ethan Hawke (Before Midnight, 2013). When Mason is little, Olivia decides to move closer to the University of Houston so she can further a career in education to provide for her family. Mason Sr. visits the children, but drifts in and out of the picture. He drives a cool car and has a more carefree lifestyle, but clearly loves his children. Olivia soon remarries a man who has kids of his own and a parenting style that’s very different from Mason Sr.
Mason’s family situation continues to evolve throughout the movie and we watch him adapt to new homes, new schools, and new surroundings. We witness his transformations from small, innocent boy to trouble-making teenager, to artistic and sensitive young man preparing for college. It’s quite fascinating to watch an actor literally age more than a decade onscreen and develop his own personality. It’s also interesting watching both parents grow older and mature in their own right. The concept of Boyhood is groundbreaking. Linklater has had experience telling stories over long periods of time as his critically acclaimed Before series (Before Sunrise, 1995; Before Sunset, 2004; and Before Midnight, 2013) was filmed over 18 years. For the past 12 years, Linklater filmed the movie throughout a few week period. He worked on that year’s script materials with a larger story and framework in mind, and the result feels authentic while still telling a fictional story. It’s also incredibly entertaining to see progression of technology because none of it is fake. Those exact Nintendo video games were truly a pastime of young boys. After growing up in the early 2000s, it’s especially fun to hear blasts from the past, as several popular music tracks of that time are played throughout. Frequent Linklater collaborates, Hawke and Arquette are excellent in their roles as the parents of Mason and Samantha and both have rightfully earned nominations for their work. The child actors do fine jobs as well, but the lack of screen experience becomes less natural and more evident as their characters grow older. Another valid criticism is the length of the movie, which is nearly three hours long. It could have benefited from additional editing, which, given the amount of filming and source material to work with was probably a herculean challenge in itself. Still, despite the length, Boyhood should not be missed as it represents a truly original artistic endeavor in an era rife with sequels, re-boots, and copycats. Bottom-Line? We’ve seen movie characters grow from a young age to an adult whether through clever makeup and wardrobes, or choosing young actors that closely resemble the adult actor. These transformations do not compare to seeing the actual actor age right in front of our eyes. 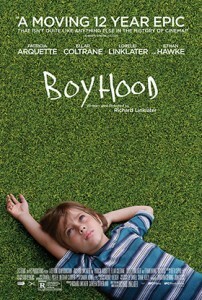 Boyhood’s unique concept, of filming the same cast over a 12-year period coupled with top-notch acting from Ethan Hawke and Patricia Arquette makes this drama worth your time.